PENCILLERS: Salvador Larroca, Max Fiumara. Cover by Juan Gimenez. 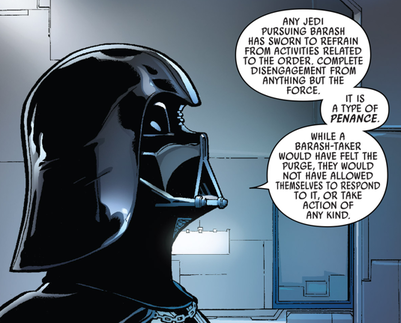 I maintain that this Darth Vader series doesn’t have to end simply because Kieron GIllen’s story is ending. 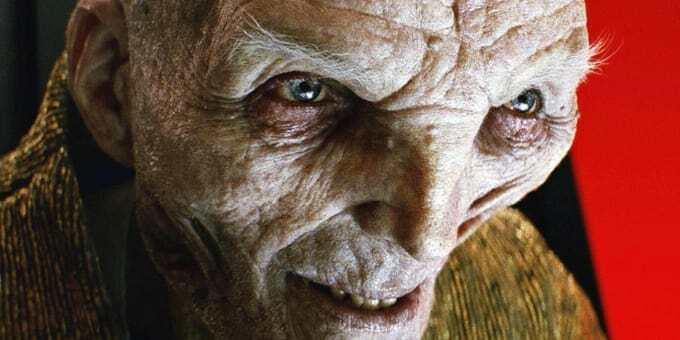 It’s not like there’s a shortage of creators out there looking for a crack at the dark lord. Nor is there a shortage of fans that will read stories about him. 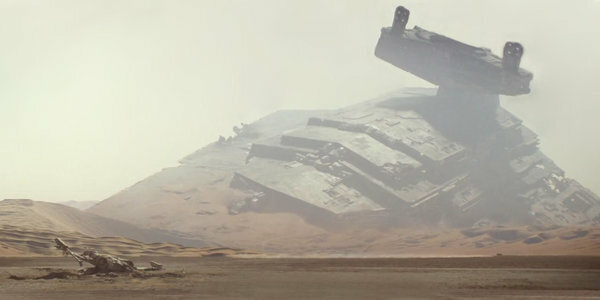 Nevertheless, for now this is the end for Vader’s ongoing adventures. Thankfully, he goes out on a hell of a dramatic note. As this series has progressed, we’ve learned it’s essentially a bridge story between A New Hope and The Empire Strikes Back. Vader goes from being in the doghouse after the destruction of the Death Star, to being in a more powerful position and obsessed with finding his son. 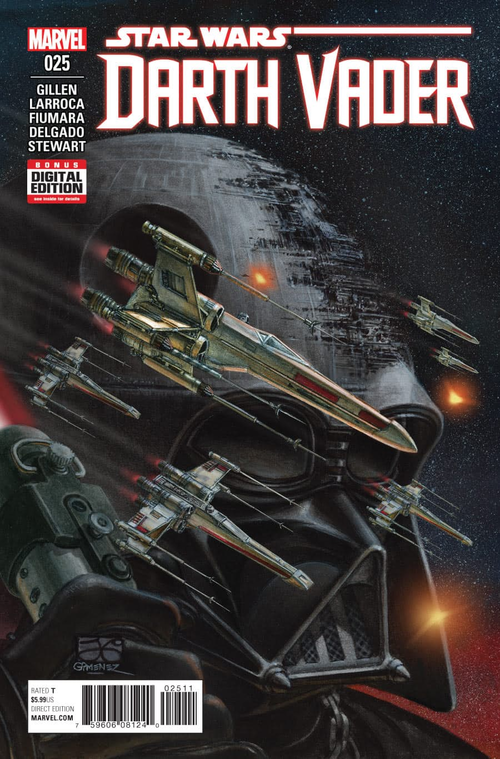 But it’s also about Aphra, a crafty archaeologist Vader forms an uneasy alliance with. 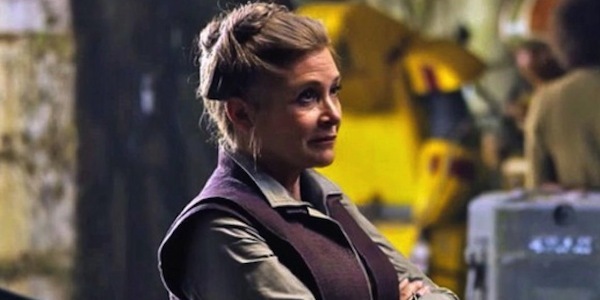 She knows Vader will kill her when she’s of no further use. In issue #4, she flat out asks him to give her a quick lightsaber through the neck when the time comes. She also asks him not to eject her into space. That scene has hung over the entire series. 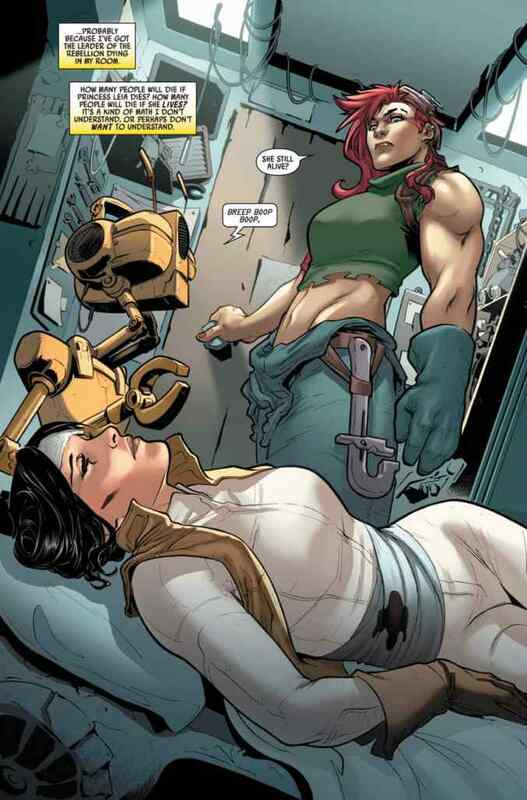 Like Aphra, we all knew it was coming. 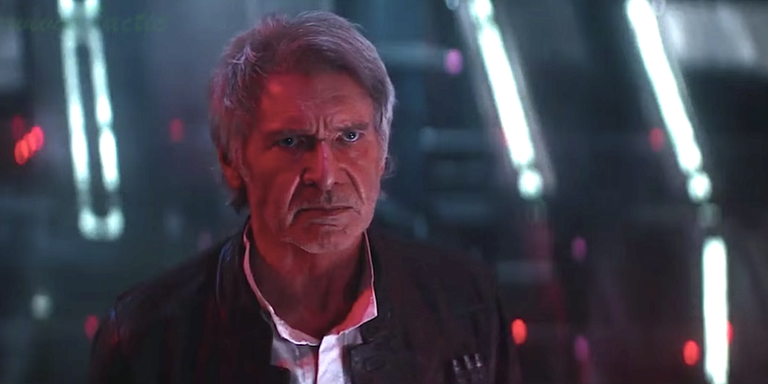 Larroca’s face work with Aphra isn’t the best here, and this isn’t the most natural looking thing in the world. But that top panel on the page at right makes the whole scene. Her body language is perfect. Then on the next page you have the simple line: “Not like this. Please, not like this.” It’s a fantastic pay off to what we saw in issue #4. And then she lives, which was actually a disappointment. 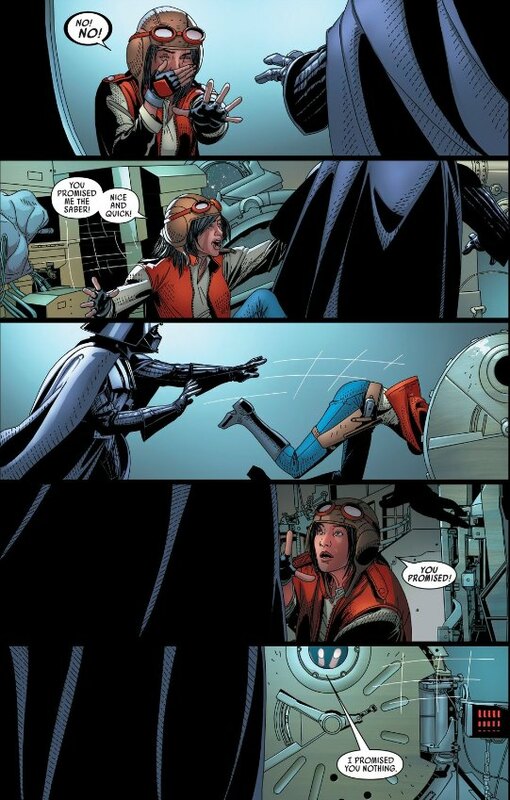 While I really dig Aphra, that’s a waste of an awesome death scene. But we’ve got a Gillen-penned Doctor Aphra book coming in December that needs its title character. That could be a great book, if for no other reason than Triple-Zero and BT-1 will be in it. Plus, after what he gave us in this series Gillen deserves to stay at the table as long as he’s hungry. Someone I could use a break from is Salvador Larroca. He’s extremely talented, he draws an incredible Darth Vader, and he’s a very natural fit for the Star Wars universe. But it’s so obvious he draws off of stills from the movie that it pulls me out of the story. Case in point, he was obviously looking at Revenge of the Sith footage when drawing Palpatine for this issue. 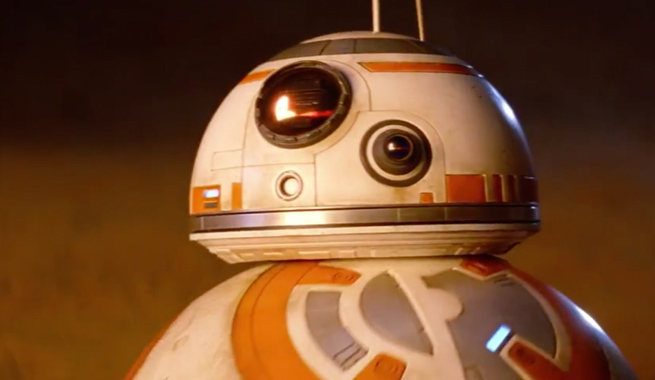 Perhaps the key is to put him on characters that don’t appear in the movies, a la Aphra or Sana Solo. On the plus side, Larroca’s final two pages are very good. 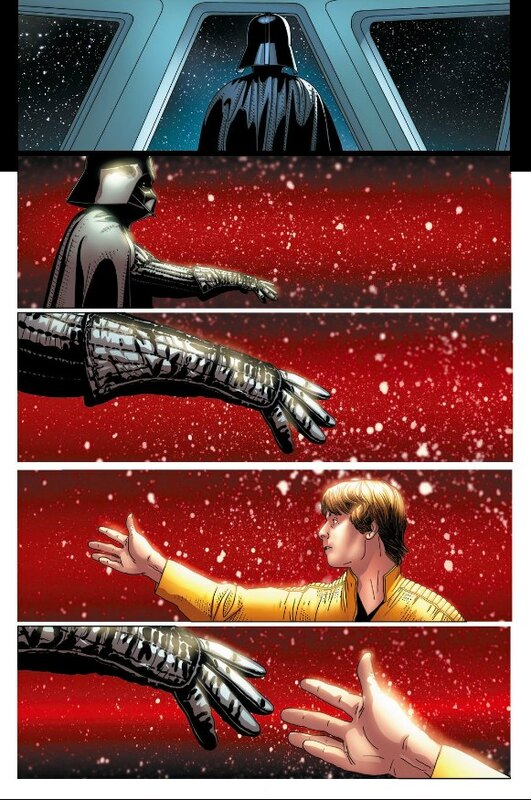 First, we see Vader and Luke Skywalker reaching out to each other in a dream-like scene (shown below). It’s somewhat reminiscent of the climax of the Empire duel, where Vader beckons his son to come with him. Then we cut back to reality, with a long shot of the bridge on the Super Star Destroyer. Again, much like Empire. We get a bonus back-up story here, pencilled by Max Fiumara. 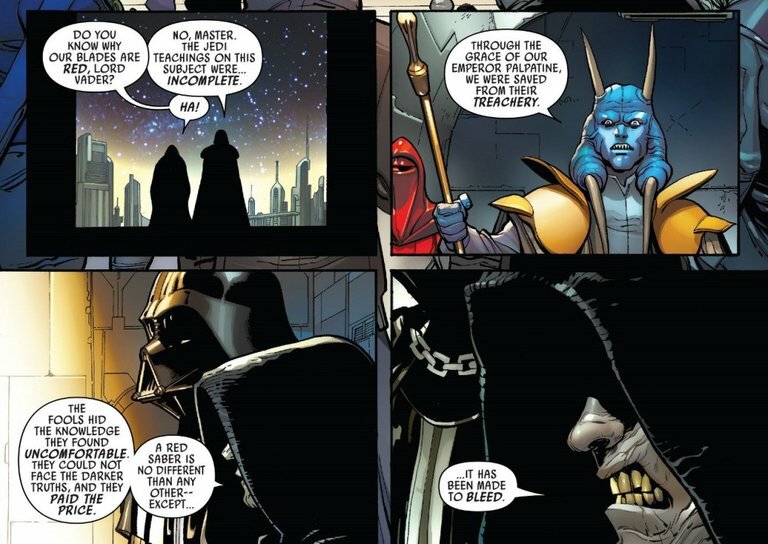 It turns out the Tusken Raiders had a rather unique reaction to Vader’s slaughtering of one of their villages back in issue #1. The story is silent, which is a nice change. There are a pair of pages where Fiumara switches to a more storybookish style, which is a cool textural change. One thing I found confusing: Someone who’s apparently meant to be an elder of sorts appears after the attack. 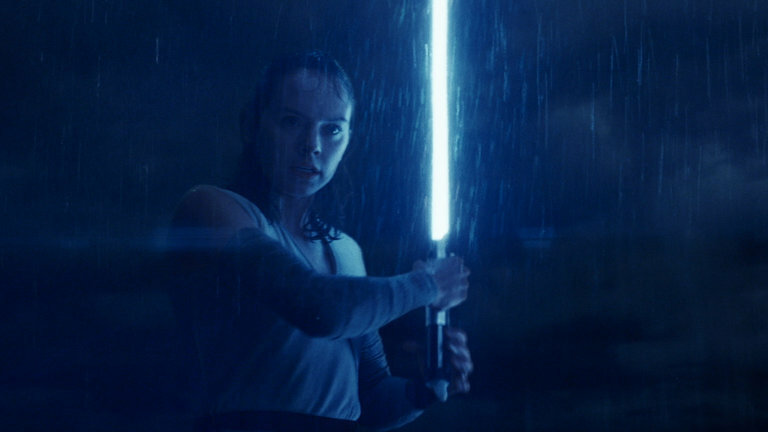 The “storybook” part of the back-up recounts a village slaughter by a man with a lightsaber. Is this supposed to be Darth Vader’s attack, or Anakin Skywalker’s from Episode II? I’d like to think it’s the latter. At one point, Darth Vader stood head and shoulders above every other Star Wars book Marvel was putting out. Over time it lost it’s must-read status, but remained supremely executed and mostly well drawn. I’m sad to see it end. Hopefully some of its momentum will carry over into Aphra’s series. 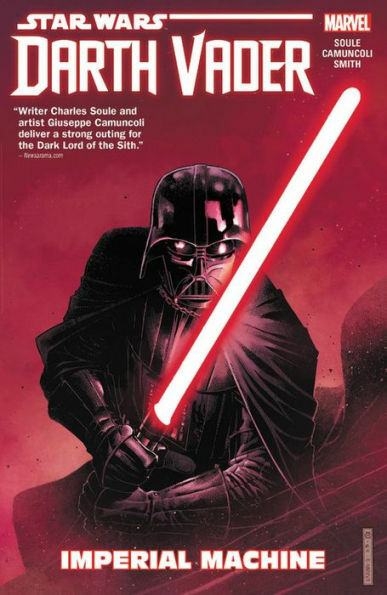 This entry was posted in Comic Books/Graphic Novels and tagged BT-1, comic book reviews, Darth Vader, Darth Vader #25 (2016), Darth Vader (Marvel Series), Doctor Aphra, Juan Gimenez, Kieron Gillen, Luke Skywalker, Marvel, Marvel Comics, Marvel Star Wars, Max Fiumara, Rob Siebert, Salvador Larroca, single issue reviews, Star Wars, Star Wars comics, Star Wars: Episode II - Attack of the Clones, Star Wars: Episode IV - A New Hope, Star Wars: Episode V - The Empire Strikes Back, Triple-Zero, Tusken Raiders on 10/13/2016 by primaryignition. 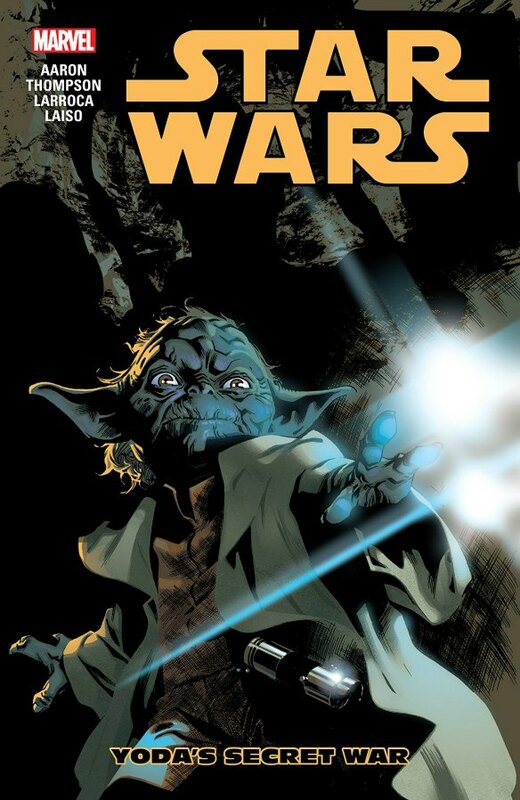 A Star Wars #20 Review – You’ve Upset the Wookie! Jason Aaron really came across something cool with these “Journals of Old Ben Kenobi” issues. It’s a great breather from the events of the ongoing series, and Obi-Wan’s time in exile hasn’t necessarily gotten the attention it deserves from storytellers. Having Mike Mayhew take a crack at it is, more often than not, a joy. A short time after we last saw this younger Ben Kenobi and an even younger Luke Skywalker, the bounty hunter Black Krrsantan has returned to Tatooine to collect the price on Kenobi’s head. 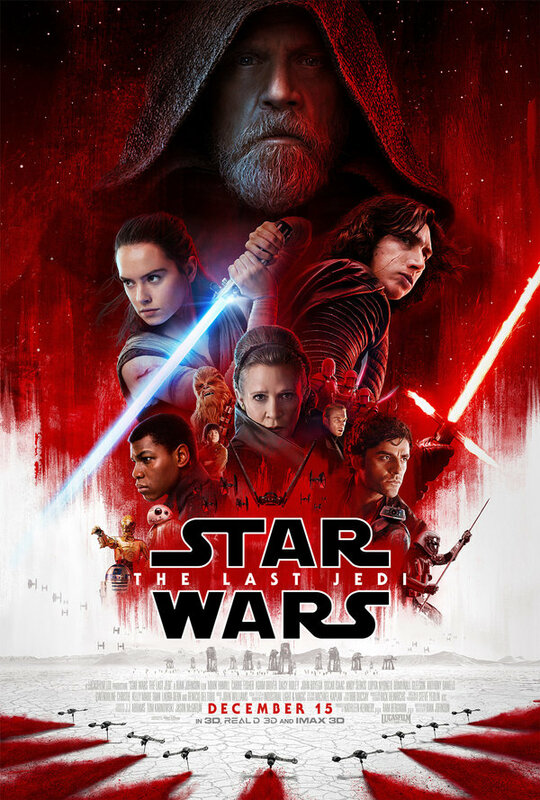 When Owen Lars gets caught in the crosshairs, Ben finds himself in a fight for both their lives. 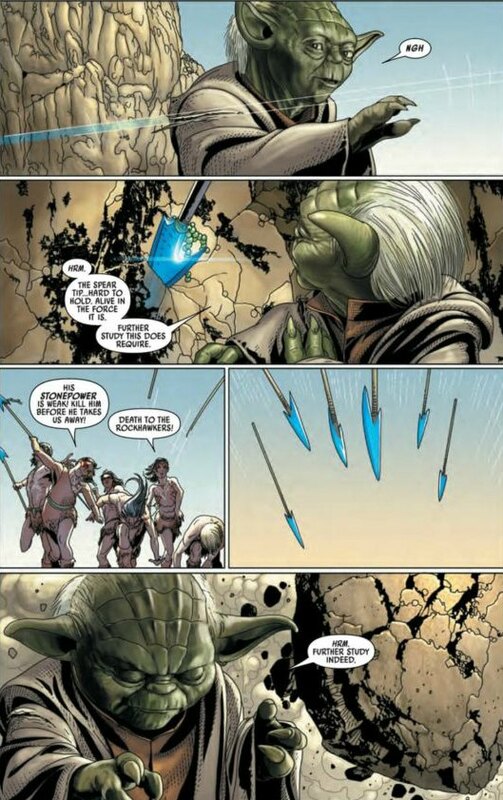 I criticized Mayhew for getting a little too cartoony in Star Wars #15. I’m happy to say he’s scaled that back here. That’s not to say our characters aren’t expressive. But at no point during this issue did I roll my eyes. For obvious reasons, that’s important. And it makes this issue an improvement over its predecessor. 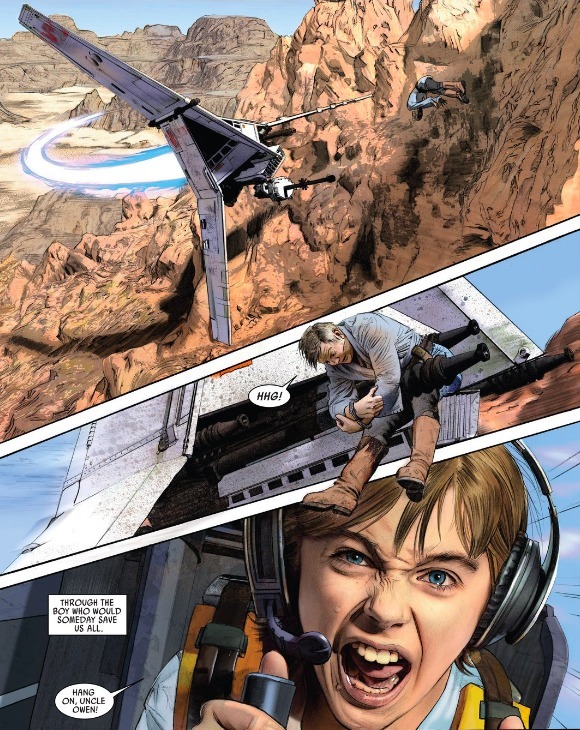 Mayhew’s rendering of a young Luke has been the highlight of his two issues. That youthful exuberance radiates off the page. It instills you with the sense that this kid is important and we need to protect him at all costs. 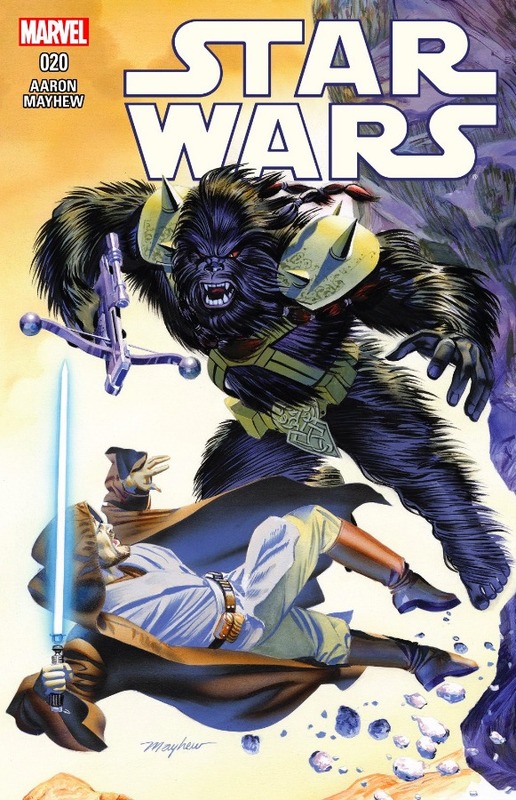 Because, of course, that’s really what Obi-Wan is fighting this wookie for. Yes, he wants to save Owen. 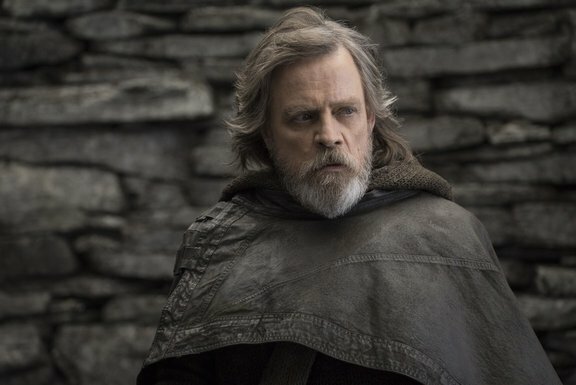 But in the end, he can’t this monster find his way to Luke. That’s almost said outright during the fight. But it doesn’t need to be. 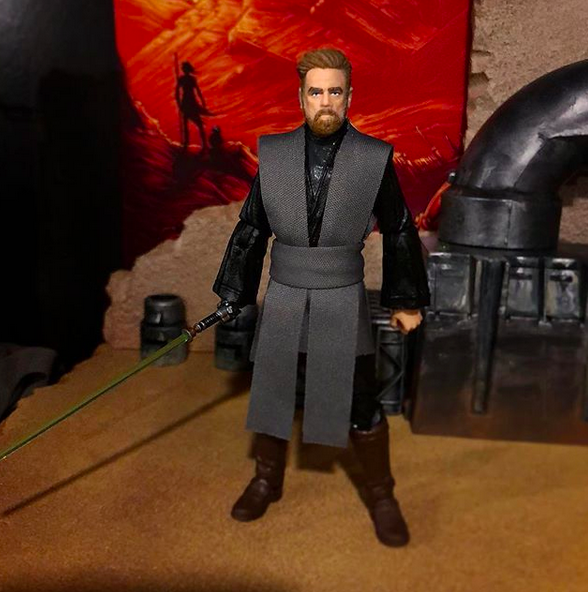 This version of Obi-Wan is interesting to look at. Not only have we never seen the character look quite this way before, but Mayhew’s photorealism makes it look like he’s being played by a new actor. An actor who not gives a fairly versatile performance, but (as I’ve said before) conveys both the charm of Ewan McGregor and the wisdom of Alec Guinness. That’s a lofty task for a comic book. But Mayhew pulls it off. In reading these journal issues, I’ve found myself wondering just how old Obi-Wan is at this point. In this issue he talks about age wearing him down. But his age has always been somewhat ambiguous, hasn’t it? Wookiepedia indicates he was born 57 years before A New Hope. Luke looks to be 7 or 8 years old here….which would put this issue about 11 years before A New Hope…which would make Obi-Wan about…46? I’ll buy that. I’m not sure how many issues Jason Aaron has left in him. But if for some reason he were to leave Star Wars tomorrow, Marvel might consider keeping him around to do an Obi-Wan miniseries, ideally with Mayhew. These flashback issues have been the highlight of the series thus far. This entry was posted in Comic Books/Graphic Novels and tagged Ben Kenobi, Black Krrsantan, comic book reviews, Jason Aaron, Luke Skywalker, Marvel, Marvel Comics, Mike Mayhew, Obi-Wan Kenobi, Owen Lars, Rob Siebert, single issue reviews, Star Wars, Star Wars (Marvel Series), Star Wars comics, Star Wars: Episode IV - A New Hope, Tatooine on 06/21/2016 by primaryignition.